Coi Rubber warrants all products to be free from defects in material and workmanship for a period of ninety (90) days from date of purchase. This warranty does not include damage to products resulting from accident, misuse, improper installation or storage, and unauthorized alterations. Coi Rubber warranty obligation shall be limited to furnishing substitute products for original products, which in Coi Rubber’s sole judgement, have proven defective in material or workmanship within the ninety (90) day warranty period. Any implied warranties of merchantability or propriety for any particular purpose, shall be strictly limited in duration to that of the express warranty set forth above. In no event shall Coi Rubber be liable for any special, incidental or consequential damages resulting from the manufacture, sale, or use of these products under any legal theory. Said damages shall include, but not be limited to, lost profits, damage to property, or damages for personal injury. Coir Rubber’s liability shall in no case exceed the price paid for the product claimed to be defective. 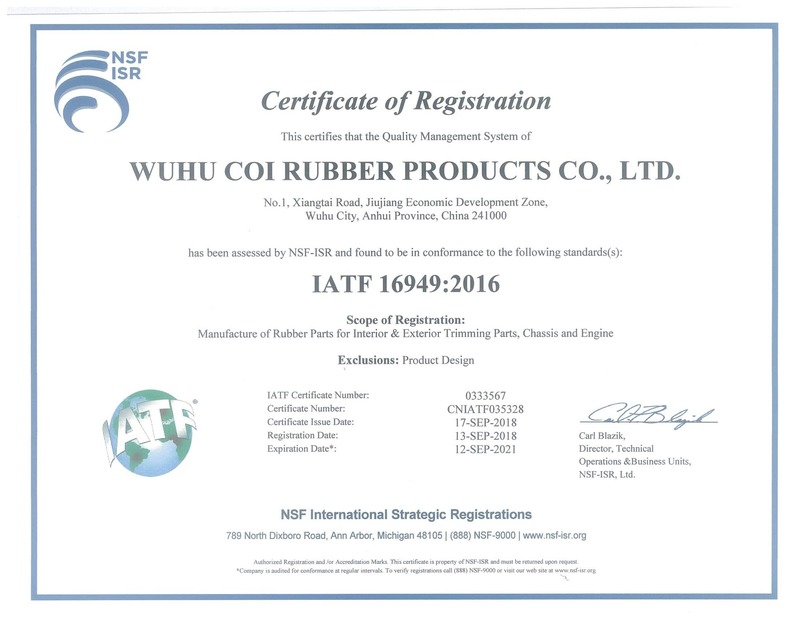 Coi Rubber will not accept returns without prior authorization. Returns may be subject to shipping and restocking charges of 25% percent of your order value or $50.00 which ever is greater. Some ingredients used in these products, or their component materials, may not be compatible with certain surfaces. These ingredients may cause staining and or other consequential damages. Coi Rubber reserves the right to ship and bill up to 10% over and under quantity ordered on all parts. Our policies are here for your reference in our efforts to provide continuous improvements in our products and services.